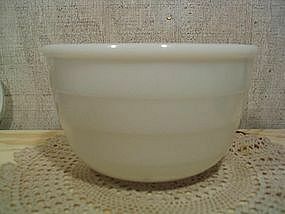 1.75 quart size milk glass. Only marked GE with no identifying numbers. There is texturing to the bowl on the bottom and lower portion of the sides. No chips, cracks, breaks or roughness. Some manufacturing flaws. I will be happy to provide additional photos.